Sanctuary by Del Satterfield is a beautifully detailed sculpture inspired by the sanctuary that God has provided for every single human life, the mother's womb. It would make a wonderful addition to any church or home decor setting. 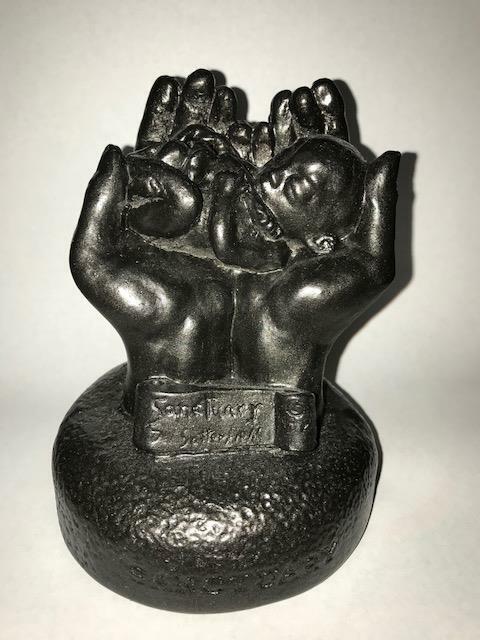 This five and one half inch tall cast hydrocal sculpture comes with a bronze toned finish and depicts a five month old unborn child resting in the loving, protective hands of God. This highly detailed piece of Christian art is an excellent conversation piece that provides an opportunity to share your faith with all who view it. Also available in bronze. See item sacbydesa.